Design custom wristbands for Texas Independence Day. Each year, March 2 marks the anniversary of when settlers declared independence from Mexico and formed the Republic of Texas in 1836. These days, throughout Texas, celebrations are thrown on March 2, a legal holiday in the state. Festivities include re-enactments, chili cook-offs, and storytelling sessions. You can make your own custom Texas Independence Day wristbands and hand them out at events and cookouts. 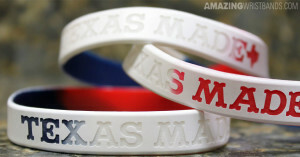 Wristbands are a great way to add to the festive mood of Texas Independence Day. They can be in blue, white, or red (the colors of the state flag of Texas) and can include phrases like “Remember the Alamo!” Texas Independence Day bracelets are a great way for kids and adults to get in the spirit of the day. They can be used for fundraisers to support local bands that play at the festivities or for student activities associated with the day. Because the day also marks Texas Flag Day and Sam Houston Day, these bracelets can do double duty in the historical department. On March 2, 1836, 60 representatives from across Texas came together to sign the newly drafted Texas Declaration of Independence, which was written much like the Declaration of Independence of the United States. The signing followed much strife and fighting, as well as a two-week convention at Washington on the Brazos. According to history.com, Texas joined the Union as the 28th state in 1845. We use 100% silicone for your Texas Independence Day bands. We offer cool special effects such as swirled or segmented colors, glitter, or glow in the dark. We do not charge a mold fee any quantity of custom bracelets. We do not require a minimum quantity for your order when ordering laser debossed and our dual layer bracelets styles. We offer free shipping, free artwork, design, and color matching. In addition to standard wristbands, AmazingWristbands.com also offers super popular slap bands that “snap” to a person’s wrist, as well as thin half-inch bands, thicker one-inch bands, adjustable bands, USB bands, silicone rings and silicone key chains. All our silicone products are made of 100% silicone so they are comfortable, durable, and non-allergenic. Build your own Texas Independence Day wristbands online!